After dealing with nearly two years of tabloid covers warning about the return of the “bad old days,” NYPD commissioner Bill Bratton has had enough. “The good old days weren’t quite [as good] as they seem to remember,” Bratton told Metro New York. “Let’s get beyond the hyperbole, let’s get beyond ‘the good old days.’ Mayor Bloomberg is gone. Commissioner Kelly is gone. Get over it.” There were 22 more homicides this year compared to last year, and the increase has sparked new concerns about gun violence in the city. 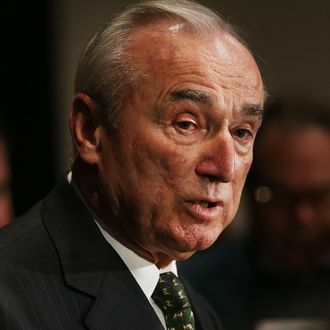 However, Bratton noted that in 2014 the murder rate was at a record low. He praised Bloomberg and Kelly for keeping crime down, but noted, “they had years that crime went up.” He added, “During our time … it’s trending in the right direction. I deal with facts, not with headlines.” Of course, it’s harder for New Yorkers to “get over” the Bloomberg years when Kelly is offering ongoing commentary on the state of the NYPD.